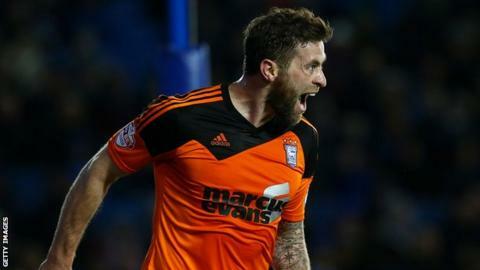 Ipswich cemented their position in the play-off places as Brighton failed to win for a fifth successive match. Daryl Murphy gave Ipswich the lead as the Irishman pounced on Lewis Dunk's mistake and fired in off the post for his first goal since 28 November. Brighton's Jamie Murphy had an effort disallowed just before the goal, while Town's Kevin Bru twice hit the woodwork in the first half. Substitute Bobby Zamora hit the bar for Albion in the second period. The win took Ipswich four points clear of seventh-placed Sheffield Wednesday, while long-time Championship leaders Brighton are fourth, five points behind leaders Middlesbrough. Ipswich showed their attacking intent early on as Bru hit the bar with a long-range effort after 15 minutes, while Brighton's Murphy was denied by an offside flag after Dean Gerken had saved Dale Stephens' close-range effort. Ipswich went ahead soon afterwards as Dunk was caught in possession, allowing Daryl Murphy to score from a tight angle, and Town could have doubled their lead when Bru hit the post before half-time. Brighton brought on Zamora and fellow striker James Wilson in a bid to find the net, but Chris Hughton's side have now gone three league games without a goal. Zamora came closest to equalising but his effort from Bruno's cross cannoned off the crossbar. "We are going through a difficult period. We are finding it hard. "We've hit a few problems and have generally worked around it, but we need to show we're good enough to get through this. "The injuries have made it difficult, yes, but we don't want to use it as an excuse. Middlesbrough were a good side when they came here, but we should have got something tonight." "I thought we had an opportunity. Brighton have lost a few players and we were playing them at a good time because we have been playing well. "I thought we were the better team to be honest. Our keeper Dean Gerken didn't make a lot of saves. We had the better chances, whereas Brighton had the ball percentage. "It's tough to get a run of away wins and we've got Burnley on Saturday - a tough ask, but we'll see. Match ends, Brighton and Hove Albion 0, Ipswich Town 1. Second Half ends, Brighton and Hove Albion 0, Ipswich Town 1. Corner, Ipswich Town. Conceded by Connor Goldson. Hand ball by Luke Hyam (Ipswich Town). Hand ball by Lewis Dunk (Brighton and Hove Albion). Attempt blocked. Dale Stephens (Brighton and Hove Albion) left footed shot from the right side of the box is blocked. Assisted by Bobby Zamora. Attempt missed. Andrew Crofts (Brighton and Hove Albion) header from the centre of the box misses to the right. Assisted by Rajiv van La Parra with a cross following a corner. Corner, Brighton and Hove Albion. Conceded by Jonas Knudsen. Attempt missed. Elvis Manu (Brighton and Hove Albion) right footed shot from the centre of the box misses to the right. Assisted by Bruno following a fast break. Corner, Ipswich Town. Conceded by Íñigo Calderón. Substitution, Brighton and Hove Albion. Elvis Manu replaces Jamie Murphy. Substitution, Ipswich Town. Brett Pitman replaces Ryan Fraser. Bobby Zamora (Brighton and Hove Albion) hits the bar with a right footed shot from the centre of the box. Assisted by Bruno with a cross. Offside, Ipswich Town. Cole Skuse tries a through ball, but Daryl Murphy is caught offside. Attempt saved. Ryan Fraser (Ipswich Town) right footed shot from outside the box is saved in the top centre of the goal. Assisted by Daryl Murphy. Attempt missed. Rajiv van La Parra (Brighton and Hove Albion) left footed shot from the right side of the box is close, but misses to the right following a set piece situation. Bobby Zamora (Brighton and Hove Albion) wins a free kick on the right wing. Offside, Brighton and Hove Albion. Bobby Zamora tries a through ball, but Jamie Murphy is caught offside. Substitution, Brighton and Hove Albion. James Wilson replaces Beram Kayal. Substitution, Brighton and Hove Albion. Bobby Zamora replaces Tomer Hemed. Corner, Brighton and Hove Albion. Conceded by Ryan Fraser. Attempt missed. Tomer Hemed (Brighton and Hove Albion) header from the centre of the box is too high. Assisted by Jamie Murphy with a cross following a corner. Corner, Brighton and Hove Albion. Conceded by Jonathan Douglas. Attempt missed. Rajiv van La Parra (Brighton and Hove Albion) right footed shot from outside the box misses to the right. Assisted by Beram Kayal following a set piece situation. Attempt saved. Jonathan Douglas (Ipswich Town) right footed shot from the centre of the box is saved in the centre of the goal. Assisted by Ryan Fraser.